Permission has been granted for one-time use only, for the purpose of website posting. No other reproductions and/or Anchorage Daily News materials are authorized. Part 1: The sale of the Whale House legacy. Part 2: Carving the masterworks. Part 3: A Tlingit buyer of Tlingit artifacts. Part 4: A dealer's passion for the Whale House. Part 5: Epic sage becomes litigation. When the whale house artifacts were secreted out of Klukwan in 1984, it seemed that art dealer Michael Johnson had accomplished what more eminent collectors had found too formidable. For a century, dealers and museums had sought the treasures of the Whale House, but none had succeeded. As early as 1901, there were reports of disputed ownership, tangled family relationships and stubborn unwillingness to trade the clan's most prized objects for cash. George Emmons, a successful collector who considered himself a friend of house leader Yeilgooxu, failed to acquire them in the late 1800s. So did a buyer for Chicago's Field Museum about the turn of the century. The late 1800s saw a growth of natural history museums in Europe and the northeastern United States and collectors were competing to fill them with primitive art from around the world. By the turn of the century, a mad rush was on for Northwest Coast Indian art. If museums didn't join the race, their collections would be left behind as supplies ran out and traditional cultures faded. The prosperous tribes of the Northwest created some of the most valued art of any American Indians. They had the luxury of spare time because of reliable food supplies and they had their choice of beautiful, straight timber. They carved everything in sight, from bowls and fish hooks to canoes and houses. But the supply of truly old artifacts was limited by the nature of the material and climate - carved wood doesn't survive long in the deep rains of the Northwest. Nor were these objects made to last forever. Louis Shotridge was born about 1882 into a noble Tlingit family and grew to be a bright, handsome youth. His grandfather was a famous Chilkat chief known as Chartrich, and his father was George Shotridge, or Yeilgooxu ("Yel-goo-hu"), the keeper of the Whale House at the turn of the century. 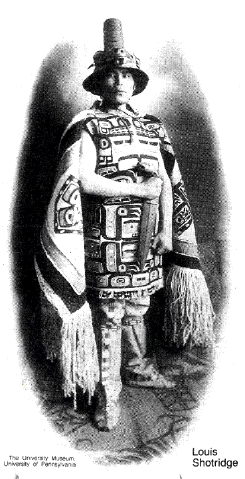 Under the matrilineal system of the Tlingits, Louis was born into his mother's clan, the Kaagwaatan, on the Eagle side. 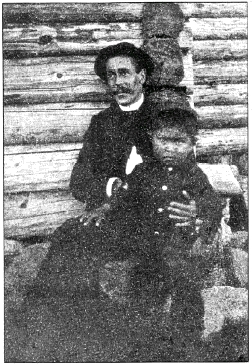 George Emmons holds Louis Shotridge in Front of a log wall in about 1885. Louis was educated at the mission school in Haines and married a beautiful and talented woman named Florence, the daughter of a high-ranking shaman from the Raven side. Florence had four years of school in Haines and was a skilled weaver of the intricate and prized Chilkat blankets. "I can secure the very best of everything there is, the real valuable ones they used to keep, things that they never thought of selling before, and I am the only one to get them too, most of the totems are owned by my father and some other things by my relatives." He shipped some objects to Philadelphia but Gordon rejected most of them because they were too new. The Shotridges spent the next few years traveling to Indian craft fairs and studying English and music. They even toured the country with an Indian grand opera company. Louis sang tenor. 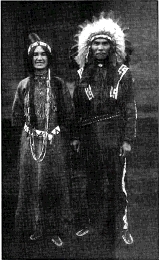 Louis Shotridge and his wife, Florence, pose in Plains Indian dress. In 1912, Gordon hired Shotridge to work part time at the museum. In 1915 he joined the staff full time. One of his assignments was to build a scale model of Klukwan. Florence helped with the collections and gave tours of the galleries, sometimes dressed in Plains Indian garments. Louis enrolled in the Wharton School of Economics, and traveled to New York to work on the study of the Tlingit language with an influential anthropologist, Franz Boas. Louis Shotridge made this model of the central part of Klukwan. In the fall of 1915, the museum sent Shotridge back to southeast Alaska on a collection expedition. He visited Klukwan twice and attended potlatches where he made gramophone recordings of Tlingit songs and stories. In his letters to Gordon he often mentioned the Whale House artifacts, but his father had died and custody of the house and its art was in dispute. Klukwan villagers stand before the Whale House in dance regalia. 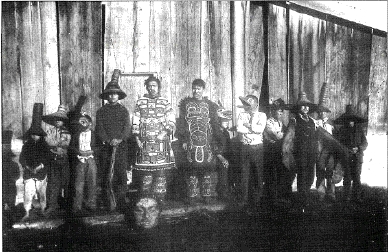 The man at center in front of the door is Yeilgooxu, or George Shotridge, wearing the Chilkat tunic. There had been no suitable replacement from Yeilgooxu's family as keeper, or hitsaati, of the Whale House. Under Tlingit tradition, inheritance would pass first to the chief's younger brothers and then to a sister's son. As the hitsaati's son, Louis wasn't eligible. Yeilgooxu had a brother named Edward, but he drank and was not deemed responsible enough. So the role of caretaker passed to a man named Yeilxaak ("Yel-kawk") who was also hitsaati of the Raven House, another Ganaxteidi house with close ties to the Whale House. Over the next few years Shotridge collected many important pieces and meticulously recorded their origins and the stories associated with them. "The things that ended up in Philadelphia as a result of his efforts, it's unlike any collected anywhere," said Steve Brown, a curator of Native American art at the Seattle Art Museum. "People would place things in a museum through him that they wouldn't elsewhere." Shotridge made cards for each piece with the Tlingit name of the object, the name of the clan, the caretaker, any previous caretakers, the artist and the occasion for which it was made. "He was very thorough," Brown said. "Nobody else ever bothered to ask those questions. Ninety percent of the stuff in museums don't have that, which makes them anonymous and useless in a way." In 1917 Shotridge collected three important helmets from the Drum House of Klukwan, which belonged to his own clan, the Kaagwaantaan. "Taking these out of the Drum-house was something like joggling a hornet's nest," he wrote to Gordon, "everybody then became the nearest kin to old Daq-tank for whom the bear helmet had been made in almost mythical time and searched for my shack to claim ownership on the wooden hats that some of them could not even identify." Florence Shotridge died of tuberculosis in 1917. Shotridge would marry twice more, both times shocking the Chilkat people because he ignored Tlingit custom and married women who are not of the clan of the previous wife. He went back to Philadelphia in 1920, having collected 232 objects on the Northwest Coast, and spent the next two years working on an oral history and collection notes. He returned to Alaska in 1922 with a $10,000 budget and a primary goal of acquiring the Whale House artifacts. He bought a 30-foot motorboat to cruise the Panhandle. Gordon wrote to warn that other museum collectors were in the field. "I know where most of the important things are, and my only obstacle is the everlasting esteem of the native owner for them," Shotridge replied. On this trip he began a push for the Whale House. In November 1922, Shotridge called a meeting of the leading men of the Ganaxteidi clan in Klukwan and gave a speech urging the sale of the objects. He offered $3,500, which he said could be used to replace the clan house that had been destroyed in a mudslide. The artifacts "will stand as evidence of the Tlingit claim of a place in primitive culture," he later wrote, describing his pitch. They turned him down. Edmund Carpenter, a New York anthropologist who wrote an essay about Shotridge and the Whale House in 1975, was impressed by the villagers' resoluteness. Carpenter himself has tried to acquire the Whale House artifacts. "There wasn't 35 bucks in the whole of Klukwan at the time and they turned it down," he said. "That's style." About that time, Yeilxaak appointed a successor, Jimmy Young, probably his sister's son although the records were vague, according to anthropologist Chuck Smythe. Yeilxaak also wrote a will that Smythe found in Alaska State Museum files. "He is assigning responsibility to Jimmy Young to take care of, but not sell," said Smythe, who investigated the Whale House lineage to support one side's legal claim to title of the artifacts. "He was really concerned about the future of tribal property and the ability of his clan's people to pay respect to their ancestors and have a record of their history and the events that brought them here." Shotridge believed he was the legal heir of the Whale House under Western inheritance laws, and that his uncle Edward was the customary successor. He convinced Edward, a true Whale House member, to attempt to annul Yeilxaak's will. 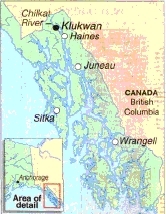 According to Maureen Milburn, who wrote an article about Shotridge for the University Museum in Philadelphia in 1986, the controversy came to involve most of the Chilkat people. "The people of Haines, white and native alike, had been planning on making the Whale House a tourist attraction," she wrote. "The atmosphere became so charged that Louis was forced to allow things to 'quiet down a bit before my uncle and myself disturb more peace.'" Shotridge went back to Klukwan in the spring of 1923, ready to take possession of the totems and wall screen. He found that Yeilxaak had posted a notice declaring himself and his nephew Jimmy Young the designated caretakers. Edward, who had promised to back Louis, had left town. "The quest for the Whale House collection consumed Shotridge. Its acquisition, the object of his present visit to Alaska, became an obsession, something on which he felt his entire credibility with the Museum depended," Milburn wrote. In 1924, Shotridge again planned to take the objects with Edward's help, "regardless of all objections of the community." Edward again went away for the summer, leaving Louis in the lurch. In a last desperate attempt, Shotridge traveled to Klukwan late that summer. "I found Yeal-hawk (Yeilxaak), the blind chief of our rival party, living all alone as a guard over the Klukwan Whale House collection," he wrote to Gordon. "The chief's heir is shrewd enough to know that we would be ashamed to take anything from the possession of the helpless blind man." His efforts caused so much animosity in the Chilkat region that a peace-making ceremony was suggested. The group of community leaders met with Shotridge and persuaded him to back down. "I realized that I was rushing the old man (Edward) to his grave by my inconsiderate business methods," he told Gordon, in an apparent turnaround. "I became aware that because the white man's laws was on my side that I became the master of the affair, and I did not like it." He continued gathering oral history from elders and collecting important objects for the museum. 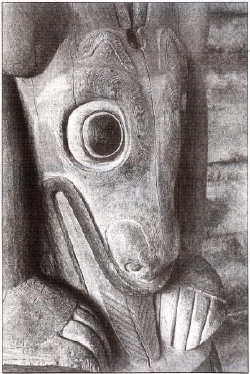 Although he had given up his quest for the Whale House, in 1925 he made a valuable contribution by recording the previously unwritten story of Kadjisdu.axtc, the master carver from Wrangell who was commissioned to create great totems and the early 19th century. In the fall of 1926, Gordon called Shotridge back to Pennsylvania, but Gordon died in early 1927, before they could meet again. Shotridge's second wife, Elizabeth, died of tuberculosis in 1928. He remained in Sitka to care for their children. One of his last acquisitions was the Shark Helmet from Sitka, the oldest possession of his own clan, the Kaagwaantan. In a letter to the museum, he expressed feelings of ambivalence. "The modernized part of me rejoiced over my success in obtaining this important ethnological specimen for the Museum, but, as one who had been trained to be a true Kaguanton (Kaagwaatan), in my heart I cannot help but have the feeling of a traitor who has betrayed confidence." He wrote that it could have been impossible if "one of the true warriors" of the clan had been alive, but he took the helmet from elderly women who could only weep as he carried it away. There are accounts of other women in the village hiding valuables from Shotridge. One man said recently that his grandmother put an heirloom helmet in a trunk and sat on its lid as Shotridge took objects from her clan house. Shotridge returned to Philadelphia in 1929 to organize his notes. But the stock market crash that fall ended the era of the great anthropological collections. The financially troubled University Museum reduced his salary, then dismissed him in 1932. In 1934, there were only two paid employees in the American section of the museum. In those years, Shotridge became active in the Alaska Native Brotherhood. He organized a branch in Sitka and traveled throughout the Panhandle to work with Native groups and record Tlingit culture. He made a living from fishing, odd jobs and the sale of an occasional artifact. In 1935, he took a job as a government stream guard. His responsibility was to prevent fishing in closed areas, and it was an unpopular duty among Native fishermen. In 1937, Shotridge was found on the ground near his cabinet in Redoubt Bay, about 16 miles south of Sitka. He had a broken neck and had apparently lain there for several days before a local schoolteacher found him. He was taken to a hospital in Sitka where he died 10 days later. Robert De Armond, an Alaska historian who was a young man then, served on a coroner's jury that investigated Shotridge's death. The jury concluded that Shotridge had fallen from the roof and ruled it in accident. But even De Armond isn't convinced that it was. "The story among the Natives has always been that he was killed by people from Klukwan," he said. "They were very clever at making it look like an accident." Though there was no proof of foul play, De Armond said there were several instances of Native men dying under mysterious circumstances about that time. Some had been suspected witches. Perhaps a Klukwan fisherman was in Redoubt Bay, found the fishing slow and spotted Shotridge. "I think it was some of the Klukwan people who were angry at him for having sold so much of the material to Pennsylvania," De Armond said. "It was one of those mysteries that never will have a real answer." Others have speculated that Shotridge was killed for ordering a fish poacher off the river. Even if his injuries were accidental, some say that passersby ignored his cries for help. At the end of his life, as in his museum career, he chose to work for a white institution that was seen as an attack on traditional Native ways. He was accused of selling out his heritage. "A lot of people want to paint Shotridge as a bad guy," said Brown, the Seattle curator. "I think Shotridge was kind of used by the museum. The efforts he was making were clearly with the idea in mind to record information which otherwise would have died with those people." Tlingit hero Dukt'ootl' tops this housepost. The fins of the sea lion he kills wrap around his head. The sea lion's tongue hanging out signifies its death. 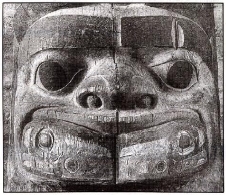 This housepost represents the story of the famous Tlingit hero, Dukt'ootl. The event took place in a village long before the Ganaxteidi moved north to Klukwan. The human figure at the top of the post represents Dukt'ootl', Black Skin, symbolizes the rock island on the west coast of Prince of Wales Island where the story takes place. The sea lion forms the central figure. His protruding tongue represents death as the body is split in half. The sea lion's fore flippers are carved parallel with the body under the man's forearms and the back flippers are shown in front of his shoulders. THE TOTEMS: This is the second of four detailed looks at the house posts of the Klukwan Whale House. This visage actually represents a rock island. STEVE BROWN: Curator of Native American art, Seattle Art Museum. EDMUND CARPENTER: New York anthropologist who wrote about Shotridge and the Whale House. ROBERT DE ARMOND: Alaska historian; served on Shotridge coroner's jury. LT. GEORGE EMMONS: Naval officer, art collector and Whale House historian. GEORGE GORDON: Curator of American archaeology at the University of Pennsylvania's University Museum. LOUIS SHOTRIDGE: Yeilgooxu's son; controversial museum collector and Tlingit scholar. FLORENCE SHOTRIDGE: Louis' first wife. EDWARD SHOTRIDGE: Yeilgooxu's brother; Louis' uncle. YEILGOOXU (or George Shotridge): Whale House keeper in early 1900s. YEILXAAK: Leader of the Raven House in early 1900s; temporary caretaker of Whale House. When Daily News reporter Marilee Enge was growing up in Petersburg, the ferry ride to Wrangell and the old house of Chief Shakes was something like the drive to Portage Glacier for Anchorage residents. It was the place you took the out-of-town guests to show them something about Alaska. 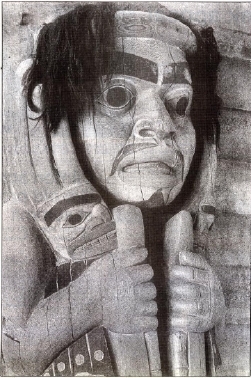 The four houseposts at the chief's house are believed to have been carved more than two hundred years ago by the Tlingit master, Kadjisdu.axtc. Though Enge viewed the Shakes posts many times, it would be years before she learned of Kadjisdu.axtc's masterpieces, the Whale House totems carved in Klukwan late in his life. Two years ago in Seattle, Enge viewed an exhibit of photographs by the early Juneau photographers Winter and Pond. Among the black-and-white pictures of Native life at the turn-of-the-century was a room-sized photo of the Whale House and its great carvings. By that time, the artifacts had been taken from the village and locked in and warehouse in Seattle while a tug-of-war over their ownership raged. Like others before, she was astounded by their beauty. And she got caught up in their history. "I guess those things really do obsess people," she said. "I started reading everything I could about them." To research this series, Enge traveled twice to Klukwan and attended part of the monthlong tribal court trial in January where the ownership fight was played out. She also went to Santa Fe, N.M., to interview Michael and Sharon Johnson about their decades-long efforts to obtain the carvings. In Seattle, she visited leading experts in Northwest Indian art for their perspectives on the Whale House artifacts and the changing ethics of collecting aboriginal works. Since her college days as a fine art student, senior photographer Fran Durner has been captivated by Tlingit design. Long before she was acquainted with the details of the Whale House carvings, she became infatuated with them through the photographs of turn-of-the-century Juneau photographers Winter and Pond. In fact, several of the images used in the series were reproduced from prints which Durner had acquired years ago for display in her home. Researching the modern and historic photographs for the series to Durner from Seattle museums to New York collectors. Hallinen first became aware of Tlingit carving a decade ago when, as chief photographer for the Ketchikan Daily News, he photographed Nathan Jackson teaching totems carving in Saxman. Since that time Hallinen has photographed the majority of the totems in Alaska, along with numerous ancient and modern totems in British Columbia. In recent years he photographed a survey of totems for We Alaskans magazine, and a story on ancient totems in their original location off Prince of Wales Island.